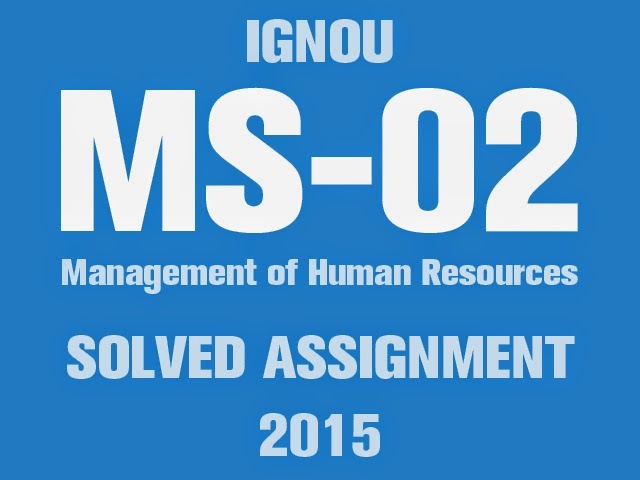 IGNOU Management Programme students can download MS-02 Solved Assignment 2015 for free exclusively on myignou.in. Management of Human Resources (MS-2) can be directly downloaded by clicking on the following download button below. 1. Briefly explain the need for, types of, and the uses of various psychological tests in the evaluation of candidates during the recruitment and selection process of an organization. Explain with examples you have had in the organization you have been working in, or you are familiar with. Briefly describe the organization and the context, you are referring to. Share "Download MS-02 Solved Assignment 2015 for Free"
Share this page (Download MS-02 Solved Assignment 2015 for Free) to let others know about it! Thank you dear for uploading MS 02 Solved Assignment. could u plz upload solved assignment of Ms 3,4,5,6,7,8 & ms 45 for 2015 assignment. yes i will upload all MBA solved assignments. keep visiting this site or like our facebook page https://www.facebook.com/myignou.in to get all MBA solved assignments as soon as they are available.